Just back tonight after a week away in Worthing staying with my daughter but, unfortunately, I left my camera behind so I am unable to bring you many photos! The highlight of the week was the Friday visits to local operator depots which would yield vehicles normally on schools duties as it was half term week down there! I initially visited the premises of Worthing Coaches and Crawley Luxury Coaches at Lancing Business Park but the highlight of the day was the warm reception I received at the Compass Bus depot in Faraday Close in Durrington. Although there was a wide variety of vehicles present, my eyes were drawn to two Wright Pulsar Gemini bodied VDLs parked together with familiar registrations. They were both former Konectbus deckers YJ05PXA/B respectively 500 and 501 in the Dereham based fleet. 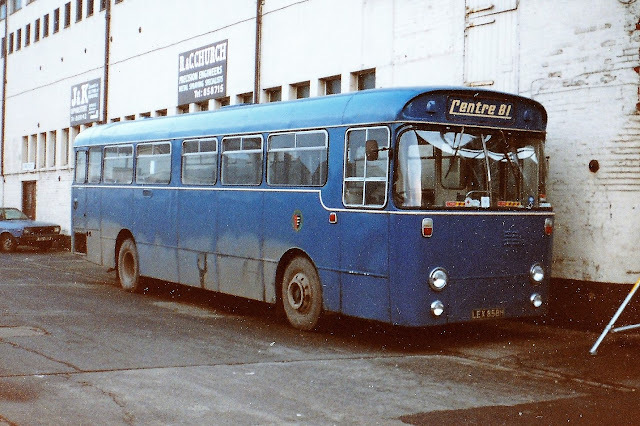 This week's Throw Back Thursday features a former Great Yarmouth blue bus in the shape of Willowbrook bodied AEC Swift LEX858H. The Swift, the first of a batch of ten arriving in June 1970, was numbered 58 in the Great Yarmouth fleet. In 1981 it passed to Centre 81 and lost its cream window surrounds. The organisation continues to provide a local community transport service today. Today's Notices and Proceedings Report contains no information concerning changes to our local bus services. However, the Report gave details of a Public Inquiry into the affairs of Paul Whincop of Peasenhall, Saxmundham at the Eastern Traffic Area office at Cambridge on 24th February 2017. On the same day the Inquiry will consider the repute of the Transport Manager. Beccles operator Anglianbus is to make staff redundant at their Ellough base. The full time equivalent of eleven employees are to lose their jobs including eight full time equivalent driving staff. The staff were informed yesterday and the decision has been made following a proposed rationalisation of services operated by the company. 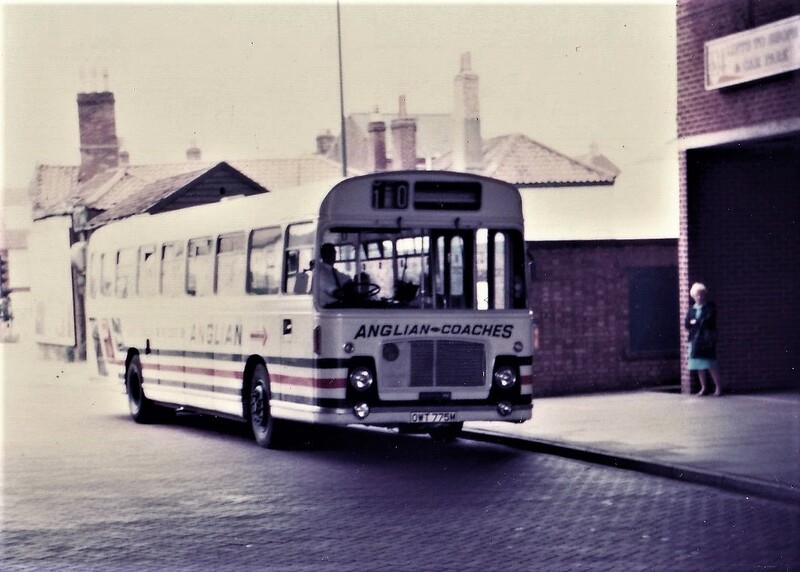 Sources reveal that the recently introduced 71 route between Belton and Great Yarmouth, via Bradwell and Gorleston, is to be axed as is the 81 Beccles to Great Yarmouth service. It is believed the 61 Kessingland to Great Yarmouth's Barrack Estate via Lowestoft and Gorleston is also affected. Further information will be published as soon as it becomes available. You will have seen from Wednesday's Notices and Proceedings Report that the operator surrendered their licence on 6th February 2017, ending a sixteen year period of service. Robert tells me that Micheal Smith and Tony Boyne, trading as Swift Taxis from 2 Queen Annes Road in Southtown, first applied for a licence during January/ February 2001. The operating centre was at nearby 173 Southtown Road. (Source: PSV Circle News Sheets). The company acquired their first 'large' vehicle in August 2005 in the form of an Ikarus bodied 43 seater DAF with the registration T826GSE. It was new to Leask & Silver of Lerwick in June 1999 when it had the registration T20JLS. Their second one was Dennis Dart L907JRN which was new to London Buses in June 1994 as their DEL7. Swift purchased the East Lancs bodied Dart from Collinson of Ribchester in Lancashire during November 2005. 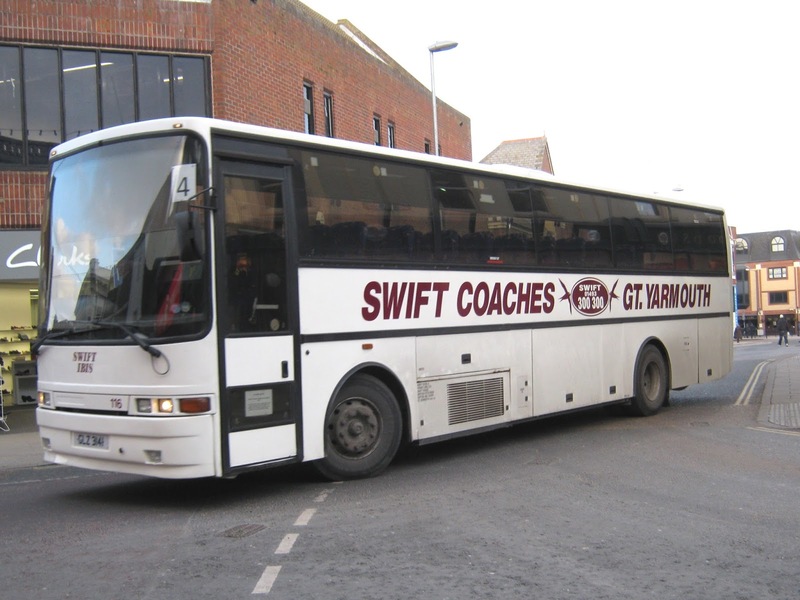 However, Swift lost many school contracts during 2010/11 resulting in the disposal of ten vehicles (including L907JRN) in an online auction by Bedford-based W & H Peacock on the 12th August 2011. 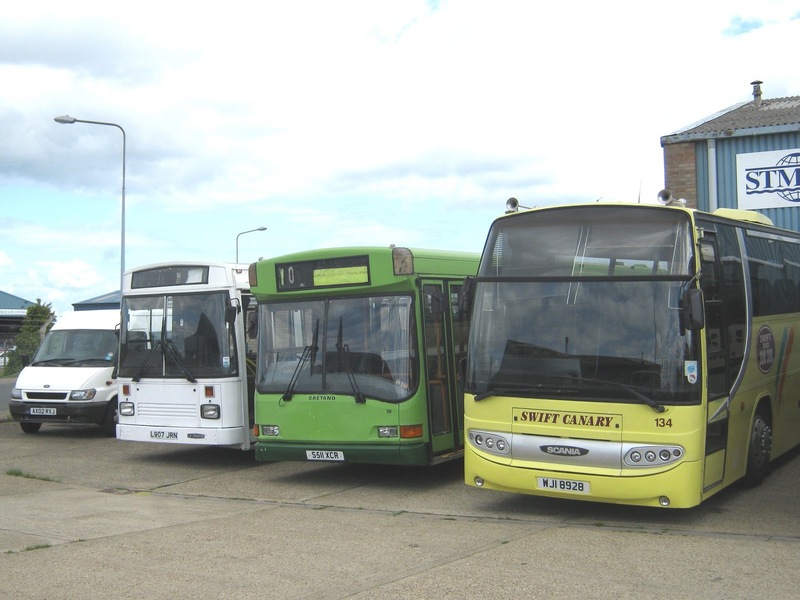 This was the beginning of the end with subsequent Norfolk County Council contracts being lost meaning the gradual sale of the fleet with Neoplan bodied Dennis Javelin SJI8127 being the last to go in early February 2016. The Swift name continues to appear on the company's freight delivery vehicles which use the old operating centre on Southtown Road. My thanks to Robert Kelly for the information. With their Irizar PB bodied Scania K380EB4 YN07LFY leaving Great Yarmouth some fifteen minutes down, there was some concern by some passengers about missing their onward connections. 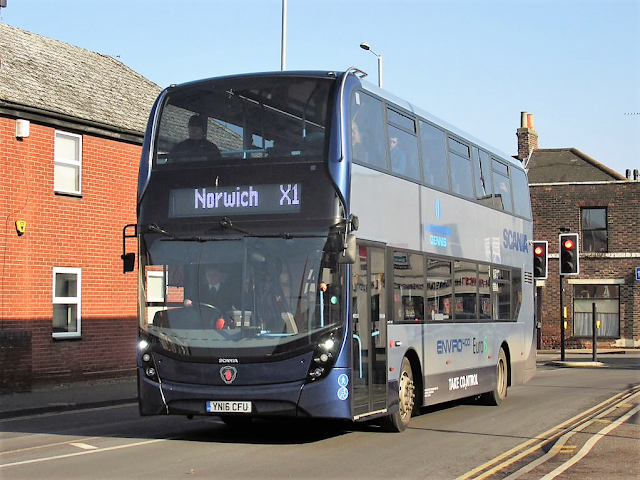 However, it appeared that all the passengers wanted to get to Norwich so the coach proceeded direct to the 'fine city' arriving just over half an hour later meaning no missed connections! The subject of this week's Throw Back Thursday returns to the old Eastern Counties Wellington Road Bus Station and its layover area on St Peter's Road in Great Yarmouth. 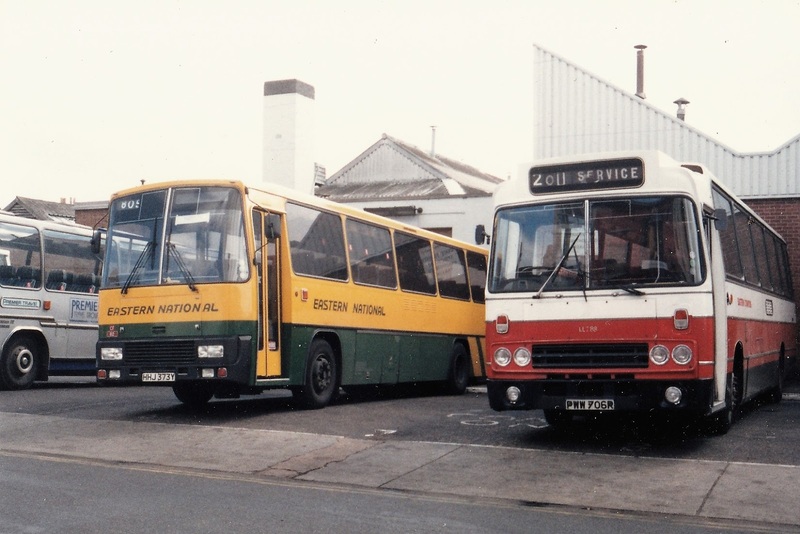 Today's offering is a photo of an Eastern National Leyland Tiger and an Eastern Counties Leyland Leopard. The former, HHJ373Y, was delivered new to Eastern National as their 1112 in March 1983. During its time in Essex it received National white and Thamesway branding/liveries and later moved on to First Western National as their 2224. The latter is PWW706R which was new to West Riding in May 1976, although it was intended to be registered as NWR505P. 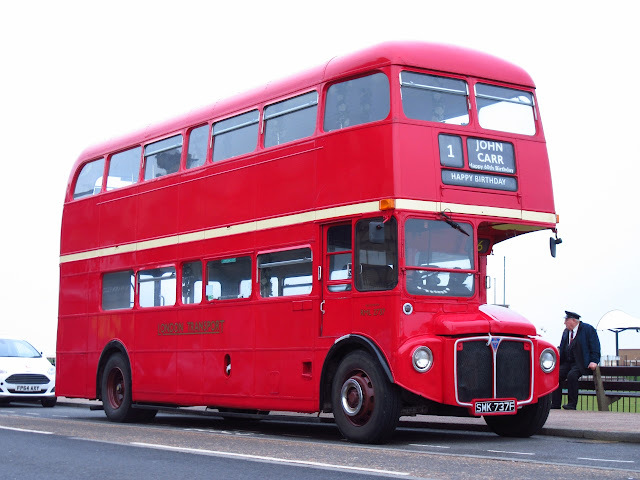 It was a dual purpose vehicle with 49 seats which passed to Eastern Counties in 1985. It spent some time based at Great Yarmouth and made its final journey to PVS (breaker) of Carlton for scrap sometime during 1987. This morning's PSV Notices and Proceedings Report contains information concerning changes to our local bus services. The East of England Traffic Commissioner's publication includes applications to vary services plus details of a number of local licenses surrendered. Four licences have been surrendered during the period under review. The most noteworthy being that held by Michael Smith and Catherine Sanders trading as Swift Taxis and Private Hire. Based at Morton Peto Road in Great Yarmouth, the company handed in their licence on 6th February 2017. 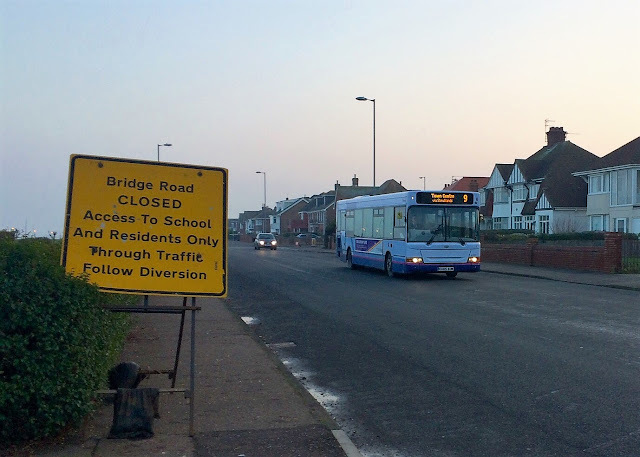 With roadworks taking place on Bridge Road in Gorleston, First are diverting buses from the road from yesterday (13th February) for five days. This is affecting daytime service 9 between the James Paget Hospital and Market Gates plus evening journeys on the 8 between the Hospital and Caister Second Avenue via Mariners Compass. 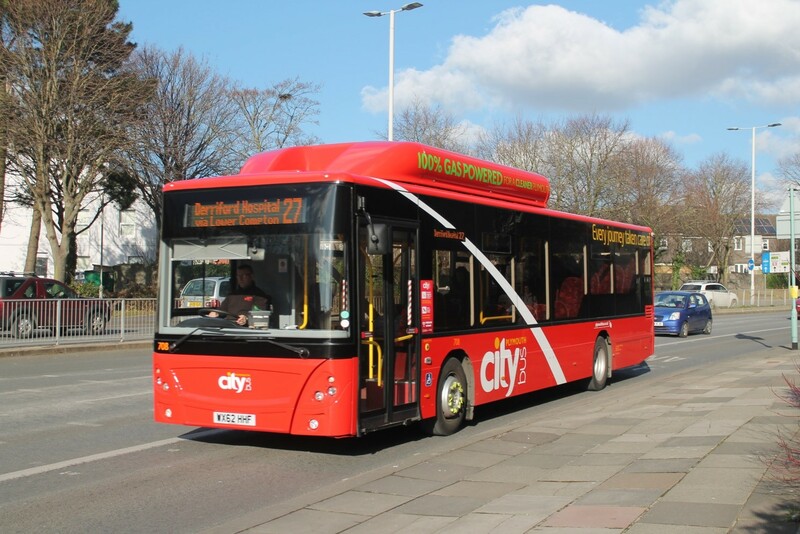 The buses affected are diverting at Brasenose Avenue by taking the A12 and gaining access to Marine Parade via Park Avenue. As you may have seen elsewhere, First Eastern Counties will be trialling a number of new double decker demonstrators over the coming months to seek replacements for their current Enviro400 working its prestigious X1 route. 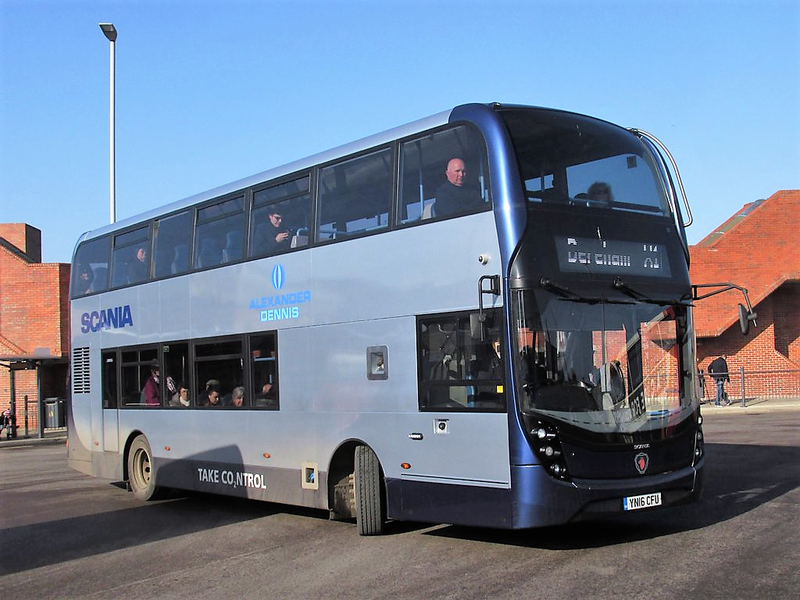 The first of the demonstrators arrived at Kings Lynn in late January in the form of a Scania Enviro400MMC registered as YN16CFU. After a short period where drivers were playing with their new toy and getting use to operating it, the Scania enjoyed its first day in public service today on the route between Peterborough and Norwich. Our roving reporter Cameron Robinson was on hand in Kings Lynn earlier today to record its movements and I would like to thank him for the use of his photos. From Monday next, 20th February, there will be stand changes at Market Gates Bus Station. The alterations, which are being made less than a year after the previous changes, will see a rationalisation of the bus stand lettering scheme. The scheme sees some stands with two shelters with none being removed as part the reorganisation. 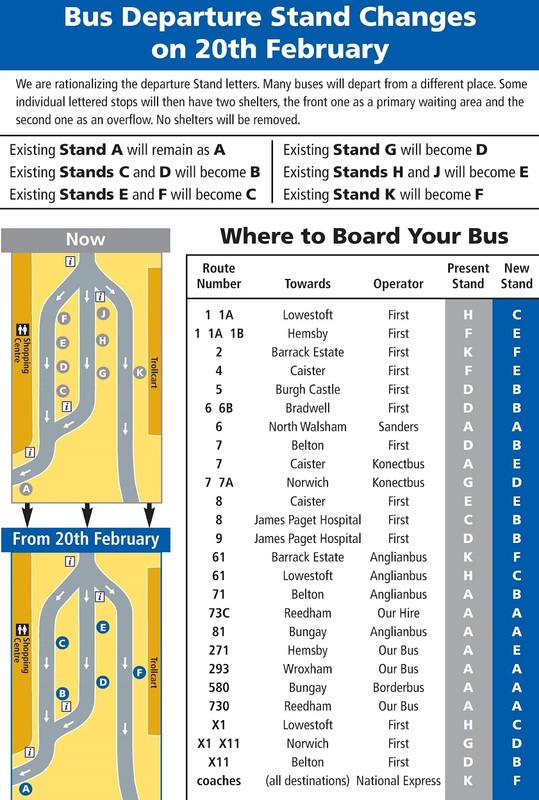 So don't forget to check the departure points as some buses will leave from a different stand from Monday. This can be easily be checked by referring to the accompanying diagram. 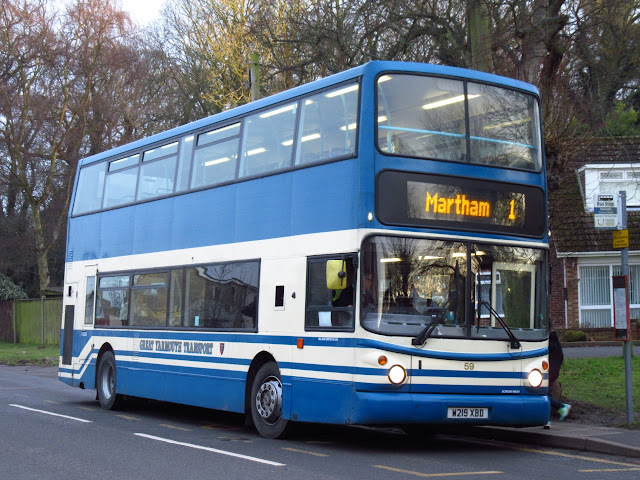 First Great Yarmouth's two non DDA compliant Volvo B7TL / Alexander ALX400s 30887 and 30902 (W742/757DWX) have been withdrawn and sold to a dealer in the North West of England. They were due to be collected by the dealer within the last couple of days with Volvo B12M / Plaxton Paragon coach 20500 AO02RBX following soon. It is believed that the dealer was offering more than scrap value and hence the reason for the agreement to their disposal. My thanks to my sources at First for the information. 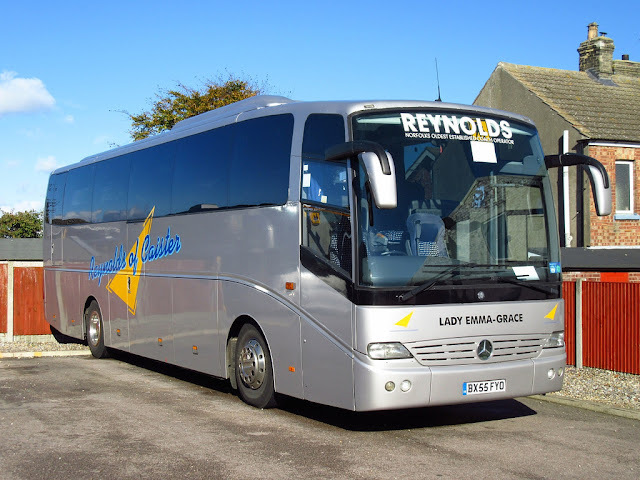 During March 2008, Reynolds Coaches of Caister purchased a new Beulas Cygnus bodied Mercedes Benz Atego thirty-six seater. However, PN08CLX didn't stay very long having been noted with Grosvenor Travel of Shaftesbury in Dorset in early 2012. 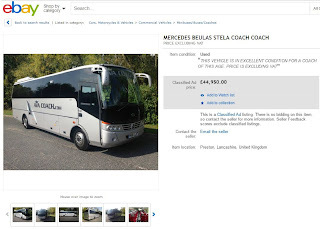 The coach subsequently moved to its current owners Avacoach of Leyland in Lancashire who have now advertised it for sale on e-Bay. The asking price is slightly below £45,000 - not bad for vehicle that was reportedly disposed of by Reynolds as it was designed on a lorry chassis! 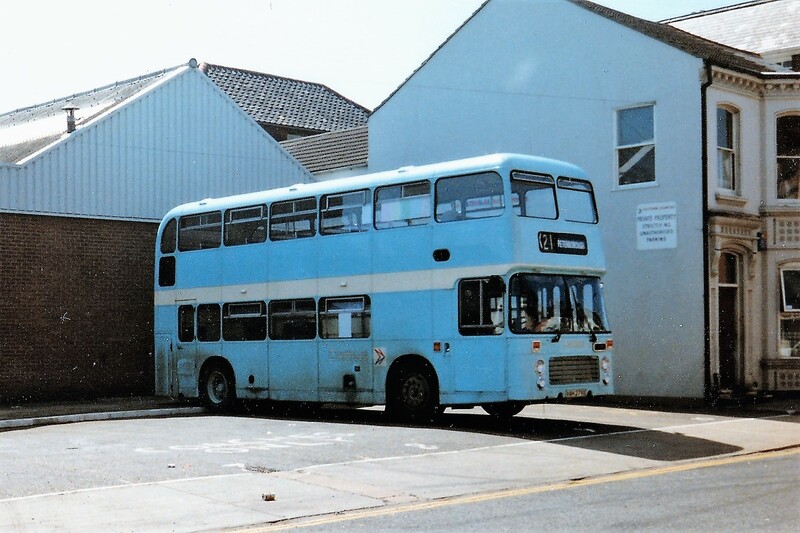 Another photo surfaces following the tidy up and this time it features a Cambus decker at the old Eastern Counties Wellington Road Bus Station. Cambus VAH279X laying over at St Peter's Road Great Yarmouth with X21 Peterborough on the blind! At the beginning of 2001 it was sold to Davies of Bettws Gwerfil Goch trading as GHA Coaches. It lasted there until November 2004 when it moved on to Pencoed Travel. January 2007 saw its last journey to PVS of Carlton for scrapping. With more engineering work being carried out on the railway around the Whitlingham area (east of Norwich) today, rail replacement coaches were in use for passengers intending to use the Wherry Lines. Lowestoft based Belle Coaches were providing replacement transport at Great Yarmouth and (presumably) Lowestoft Railway Stations today. At lunchtime, two of the fleet were were in attendance at the former in the shape of Setra LIL9718 and Van Hool bodied Scania LIL9714 with two friendly drivers in attendance. Unfortunately the sun wasn't playing ball today which made taking a reasonable photo quite difficult with the camera facing directly into it! Couple of sightings to report whilst out and about today, firstly was the sight of a Routemaster once again on Great Yarmouth Seafront. SMK737F is owned by Bus and Us Ltd of Melton Constable, the company own a fleet of London Routemasters which they hire out and SMK737F joined the fleet in 2015. It was noted along the Golden Mile this afternoon near Britannia Pier in use as transport for a 60th Birthday Celebration. Second sighting was a bit closer to home, across the road to be exact! GYT liveried 32059 W219XBD was on duty to Martham on the 1's today and seen above in Ormesby St Margaret. A study of Route One's vehicle database yesterday revealed some items available for disposal by two local operators. Reynolds of Caister is advertising the availability of its Mercedes Benz Tourismo BX55FYO. The 49 seater was acquired from Clarkson of South Elmswell in April 2011; they purchased it new in January 2006. It was subsequently named Lady Emma Grace by Reynolds. AFSC Limited, trading as Marett's Chariots, have two vehicles available for sale - Mercedes Benz Vario VX54CKJ and Ford Transit YK61UGE. The Merc was previously with Field of Aylmerton whilst the Transit was bought new by the company as YK61UHG in December 2011. The latter is being sold off due to the loss of a contract. My thanks to Grahame for the use of the photo of BX55FYO and to Robert for the information. David McMaster is to amend the timetable of the Norwich City Sightseeing service from 1st April 2017.